Tonight marked another successful running clinic. Lisa and Emily were able to trim a good 20 or more seconds off their original running times AND ran a whole two-miles today. Congratulations to those two! During the past two months of the running clinics, Rik, Emily, and Lisa have made great progress in their breathing, form, and speed – great job! I posed this challenge to Lisa and Emily today and wanted to invite the rest of you to join us. 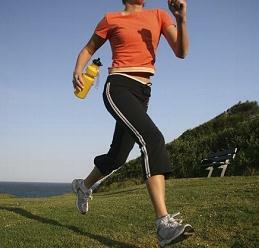 Take some time in the next few days to go for a two-mile run. A two-mile run that’s all about you. No distractions – no dogs, spouses or friends, watches, phones, or iPods. Just you and your running shoes. Concentrate on your breath and those two miles ahead of you. Nothing else matters except tapping into that zen of running. By the end of the run, you should be able to gauge what was hard and what was easy for you. How was your breathing? How did your body feel? Did your feet, shins, calves, hamstrings, hips, shoulders, or back ache? Was the beginning of the run more challenging than finishing the run? Or vice versa? How was your energy level? Take notes, so you can ask questions and find solutions to any issues that may arise while you run. If you find yourself daunted by running two full miles, break up the run. Run approximately 5 minutes and jog or walk another 5 minutes, and then pick it right back up. Running 5 more and jogging 5 more until those two miles are complete. You can map out an approximate two mile run in your neighborhood or somewhere nearby on http://www.mapmyrun.com/ If you need help or advice, feel free to comment below. Good luck!